Renegade’s top rated beer is getting diversified. Endpoint Triple IPA, rated 93 on ratebeer.com, does not only top Renegade’s other beers in ABV but is a leader in the market. This 11% IPA was the second beer Renegade put into cans since opening in 2011. The year it was released, this brew was rated #2 best beer in Colorado by voters in Denver Off the Wagon. It remains sought-after by hop heads around the country with reviews nation wide despite its availability in only 5 states. This strong and balanced Imperial IPA will be adding a member to the family this spring. 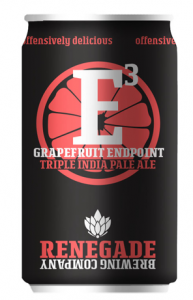 Renegade Grapefruit Endpoint is scheduled to be released in April. While Endpoint boasts complex hop character, many are surprised to find that it is a single-hopped beer using only Summit hops. Summit is a versatile hop that is appropriately used in the bittering, flavor, aromatic, and dry hop additions. Of the many flavors that Summit hops produce, grapefruit is a predominant one. 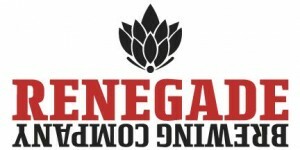 Renegade’s brewers experimented with different one-offs for the popular triple IPA. Some included different yeast strains, single hop varieties, and other flavor experimentation such as mango. When Renegade Grapefruit Endpoint was released in small-batch draft it was the clear winner. To get the perfect amount of fresh grapefruit flavor, this brew adds natural grapefruit in two ways. Initially, the brew will appear to be like any other Endpoint brew until it reaches attenuation-the point in which yeast has finished fermenting sugars. At this time the brewers will add natural grapefruit rind to bring out bitterness and whole grapefruit sections to bring out the juicy flavor already created by the hops. The end product is a dangerously drinkable and all natural 11% IPA. In the search for a complex and delicious beverage, this is the Endpoint. Renegade Grapefruit Endpoint will be available in limited quantities in every Renegade market: Colorado, Kansas, Nebraska, Wisconsin, and Arizona.